I just finished this book and thought it was superb. Very easy reading, short chapters, light and airy styling. Although written by two men, Philip Gulley and James Mulholland (both Quaker ministers), it was written in the first person singular. It is essentially a compendium of their experiences and thoughts of Jesus and his kingdom. I was lead to this book by reading Gulley’s blurb on the jacket of a Brennan Manning book . Gulley has a series of books about hometown Indiana and has been compared to Garrison Keillor. He also has (or had?) a program on public radio. I am looking forward to checking him out more thoroughly. This entry was posted on October 11, 2007, 8:31 am and is filed under Books, Christianity, Church, Emerging Church, Faith, God, Gospel, Heaven and Hell, Religion, Religious Tolerance. You can follow any responses to this entry through RSS 2.0. You can leave a response, or trackback from your own site. Thanks Anita. I intend to read that one next. Right now I am reading Huston Smith’s “The Soul of Christianity” . Very good. 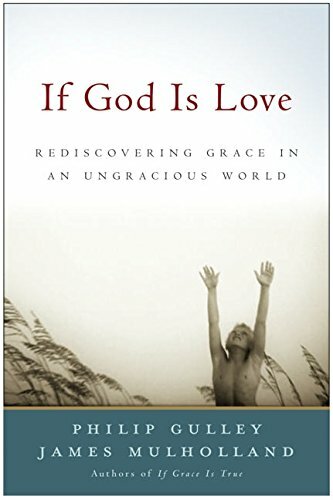 I too have read their “If God is True…” book and like anita found it did the same thing, really started a shift in my thinking about Grace. Another good one is Phillip Yancy’s, “What’s so amazing about grace?”. Also, as you mentioned, anything by Brennen Manning. I really like his work. Reading his work really started my healing process. Thanks preechaman. I’ve read just about all of Yancey and Manning. The Ragamuffin Gospel was pivotal for me as well. A lot of my friends won’t read the book – too touchy-feely, they say. I don’t know – those scenes that take place at the AA retreat – not very touchy-feely. The word brutal comes to mind. In fact, I think Manning sums it up with his phrases “ruthless trust” and ‘relentless love’. Great stuff. The only problem I have with Manning is that I can’t remember which books I have read. The cover art and the content don’t really stand apart from each other. And I find that Yancey has a tendency to repeat the same anecdotes again and again. This is too apparent if you are reading some of his books back to back. But good stuff as well.